If salt, grease and take-out are what comes to mind when you think of stir-fried rice, there’s only one practical solution. Make this version quick! 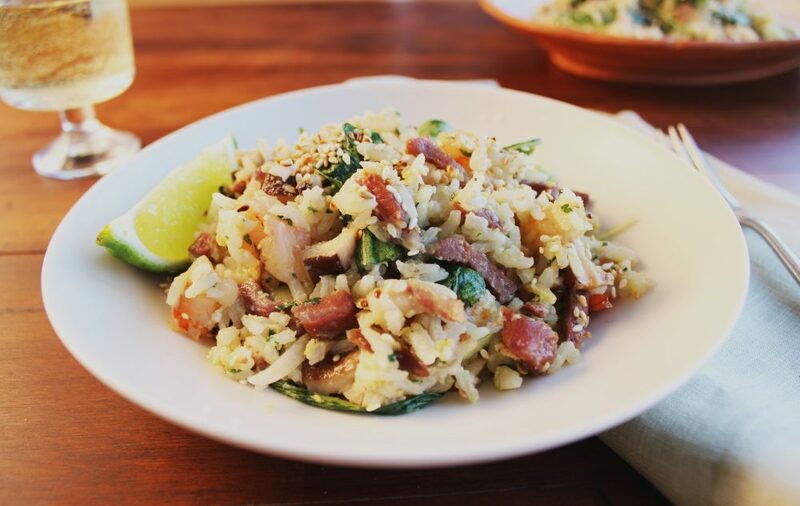 Prosciutto di Parma, garlic and ginger are the perfect seasonings to ensure the rice stays light and flavorful without being weighed down. This stir-fried rice guarantees a lovely amalgamation of aromatics and vegetables which makes for an inviting texture. In addition to the blend of colors that will liven up your plate, this dish will also turn heads and widen eyes. For best results, fluff it up with a fork before serving and sprinkle with lime! In a large skillet heat 2 tablespoons of the oil over medium heat. Add prosciutto, garlic, and ginger. Stir 1 minute. Add mushrooms; cook, stirring constantly, about 3 minutes. Add the shrimp, sherry and pepper flakes, cook, stirring frequently, just until the shrimps are cooked through, 2 to 3 minutes. Transfer to a bowl; set aside. Wipe out the pan; return to medium heat. Add remaining 3 tablespoons sesame oil. Add rice to the pan; let cook a few minutes, until the bottom is a little crispy. In a small bowl beat eggs, cilantro and fish sauce. Push rice to the side; add egg mixture. Let cook 1 minute, until partially set. Stir in the rice. Stir in prosciutto mixture. Add tatsoi, scallions and sesame seeds. Toss. Serve with cilantro sprigs and lime.